Today we have a TwoFer, that is 1 card for Two challenges. Today I played along with ColourQ329 and Freshly Made224. Below is my card. The stamps used are all from Flourishes. Image and sentiment was stamped in Momento Black. The Flowers were colored with Copics. The sentiment was sponged with SU! Crisp Cantaloupe. Die cut is from SU! Pearls are from SU! 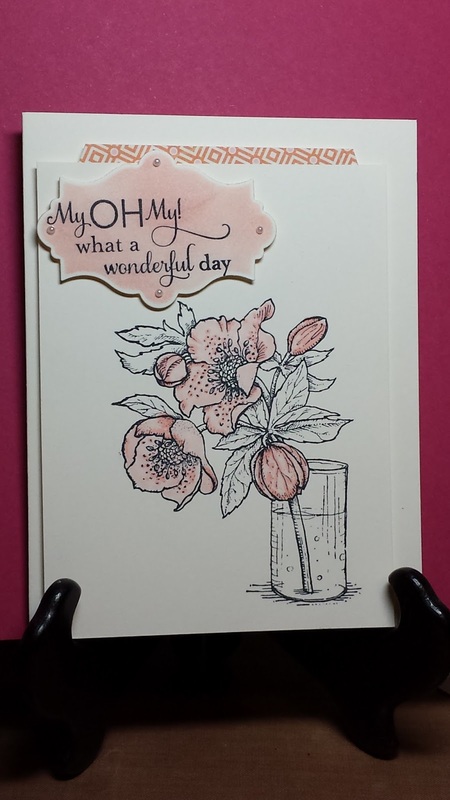 So pretty, love the colours and the beautiful stamped imaged you have used. This is so lovely in shades of black, white, and pink! Thanks for joining us at colourQ and Freshly Made Sketches! Such a gorgeous card, and I love how you selectively colored a few elements in that pretty light pink. Thanks so much for playing along at ColourQ this week. Beautiful image and I love your soft coloring! Thanks so much for joining us at Freshly Made Sketches. Beautiful card Betty! I sure miss those wonderful Flourishes images :) !!! Thanks for playing the CQC with us!